The Committee for Economic and Racial Justice was established in February 1934 by a group of like-minded social activists following their resignation from the Fellowship of Reconciliation, a pacifist organization. 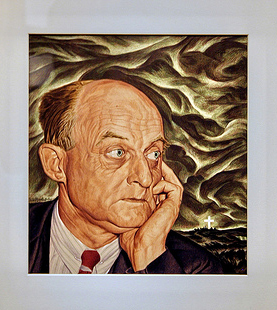 Reinhold Niebuhr, a Protestant theologian and liberal sociopolitical philosopher, served as chair, with socialist Elisabeth Gilman as treasurer and Howard Anderson "Buck" Kester as southern field secretary based in Nashville, Tenn. Kester and his family moved to Black Mountain, N.C., in 1939. Kester proposed an agenda to encourage interracial understanding among students, promote the Socialist Party, develop educational programs for agricultural and industrial workers, investigate instances of racial and economic injustice (including lynchings and riots) for the National Association for the Advancement of Colored People and the American Civil Liberties Union, and generally champion the cause of the South's disinherited peoples. Over time, key committee members, including Niebuhr and Gilman, began to feel that Kester had strayed too far from the committee's original goals and that they now had too little information about and control over his activities to warrant their continued support. By 1941 the Committee for Economic and Racial Justice had been dissolved and its programs transferred to the Fellowship of Southern Churchmen, with Kester acting in a similar role. Robert F. Martin, Howard Kester and the Struggle for Social Justice in the South, 1904-1977 (1991). John A. Salmond, "The Fellowship of Southern Churchmen and Interracial Changes in the South," NCHR 69 (April 1992). Oral History Interview with Howard Kester, August 25, 1974. Interview B-0007-2. Southern Oral History Program Collection (#4007) in the Southern Oral History Program Collection, Southern Historical Collection, Wilson Library, University of North Carolina at Chapel Hill. http://docsouth.unc.edu/sohp/B-0007-2/excerpts/excerpt_4211.html (November 5, 2012). Howard Kester Papers #3834, Southern Historical Collection, The Wilson Library, University of North Carolina at Chapel Hill. http://www.lib.unc.edu/mss/inv/k/Kester,Howard.html (November 5, 2012). Martin, Robert F. Howard Kester and the Struggle for Social Justice, 1904-1977. Charlottesville, V.A. : University of Virginia Press, 1991. Baker, Ernest Hamlin. "Reinhold Niebuhr." 1948. Image from Flickr user cliff1066™, November 28, 2008. http://www.flickr.com/photos/nostri-imago/3006645667/ (November 5, 2012).